The day began in earnest when I met with Kate Lorenz, MAPH Alumna and Executive Director of the center, across from all those post-its in one of the center’s community rooms. We talked briefly about HPAC’s history—the large community, classroom, and gallery space located on Hyde Park Blvd. at Cornell is a relatively recent development—before grabbing some coffee from the center’s recent addition of Bridgeport Coffee (replacing Istria). Though initially the center seemed subdued, over the course of the day it became clear that beyond the calm hush of the galleries, there was a whirlwind of incessant activity. I saw a steady stream of students, both adults and children, coming in to the center for classes, although I had no idea where they were tucked away. That is, until I was told to walk through the vending machine next to the desk where Greg Smith—Outreach Director responsible for the HPAC programs in Chicago Public Schools—worked. Incredulously, I tugged on what I thought was the vending machine only to realize it was actually a door to several busy classrooms and workspaces. In one, I observed a children’s theater camp, where various kids were learning simultaneously to act out different scenes and to work as a team, accommodating each other’s actions and thinking through the script that one of them had developed. 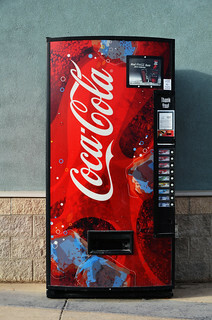 A vending machine. This one probably isn’t a door. But apparently you never know. The importance of having students take ownership of their own work was also reflected in the center’s galleries, one of which was dedicated entirely to the work of students from the now-closing Cantor Middle School. Another gallery featured Articulating the Edge, the art of students participating in HPAC’s ArtShop program. I was (perhaps unsurprisingly) ridiculously excited to see students’ art so prominently featured—to see community not only interacting with the arts, but forming the bulk of the artists themselves. More than that, though, I was impressed by how skilled these young artists were: I found myself lingering at more than a few of their pieces wanting to know more about the stories behind them, haunted by the Robin-Hood-esque crimefighter in a graphic story, struck by a series of photographs of women at seemingly private moments. Art, community, life—these were the same main components as in the work of artist-in-residence Jen Delos Reyes. 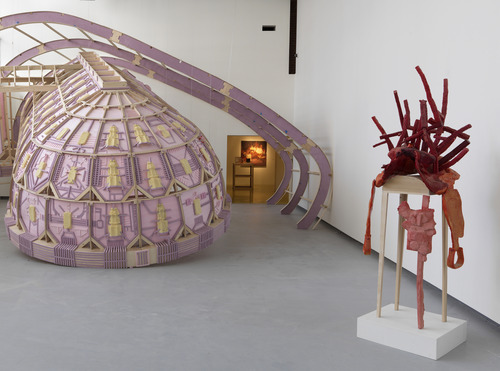 As co-director of the Art and Social Practice MFA at Portland State University, Jen focused her residency on researching artists whose art is integrated with their life, rather than something treated as a separate practice or work. She was drawn to Chicago as a hub of community art and artists who reflect on the impact of art on life, communal and individual, and of life on art. In other words, art doesn’t exist in a vacuum: it’s inherently tied to its moral, ethical, and communal implications, and as such, an artist should think intentionally about how life, community, and art work together. This idea was perfectly fitting of what I saw at the Hyde Park Art Center: galleries act as community spaces, and the community creates the work in the gallery. One of the biggest difficulties in any arts-oriented non-profit is how to reach the community. Brook Rosini, MAPH Alumna and Marketing and Communications Manager, explained that although most locals in Hyde Park are aware of the center, many tourists—Chicagoans or otherwise—pass by the center on their way to the much larger Museum of Science and Industry. But more than the difficulty of competing with large institutions, an arts non-profit like the Hyde Park Art Center faces challenges in its location (“What? There are things to do on the South Side?”), with coordinating with the Chicago Public School system, and with building its profile via a limited number of people (ah, life in the non-profit world). Yet despite that, the Hyde Park Art Center is thriving. Did I mention that our Alumni are doing seriously awesome work? You should definitely check it out sometime.